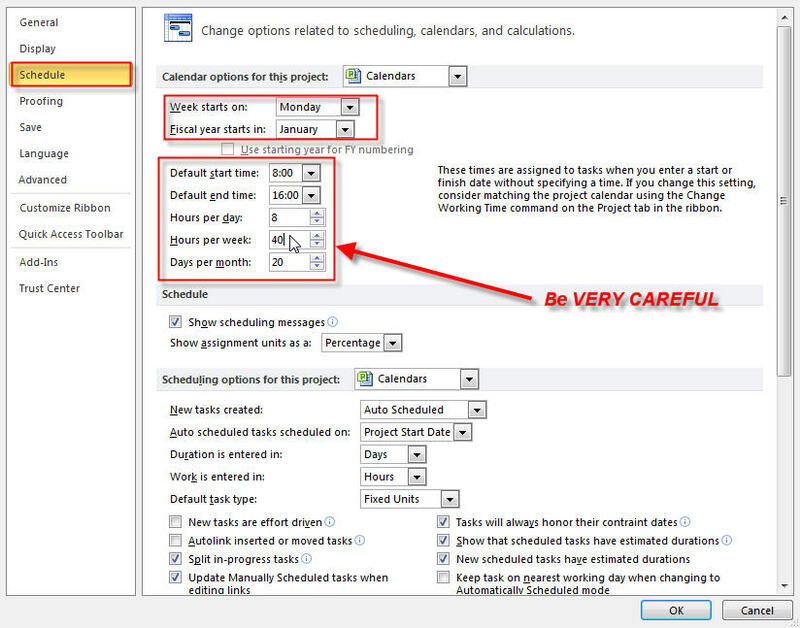 Scheduling problems in MS PROJECT 2010 – Part 2.
for tasks into MS PROJECT. I WILL NOT write about constraints and limitation with this method (for example about flexible and hard constraints and why this is not the best approach). I will just show you how duration is affected when you put those dates into MS PROJECT. We have told MS Project that regular working time will be Monday – Friday from 08:00 AM until 16:00 PM, 8 hours without lunch break. What do I get? Task 1 has duration of 0,5 days, and Task 2 duration of 1 day. WHY? Task 1 has duration of 0,88 days, and Task 2 duration of 1,75 day. Now, you know the duration formula, don’t you? Duration of one day means 8 hours. We will work 7 hours on Task 1 (because we put that in the calendar; from 08:00 till 15:00). 7 working hours / 8 hours per day in scheduling options = 0,88 days. For Task 2 we will work 7 hours on 22.03.11 and 7 hours on 23.03.11 so it means we will spend 14 hours in total. And 14 working hours / 8 hours per day in scheduling options = 1,75 days. per day. So 8 working hours / 8 hours in scheduling options = 1 day. Well, nothing is wrong. That is the way MS PROJECT works. 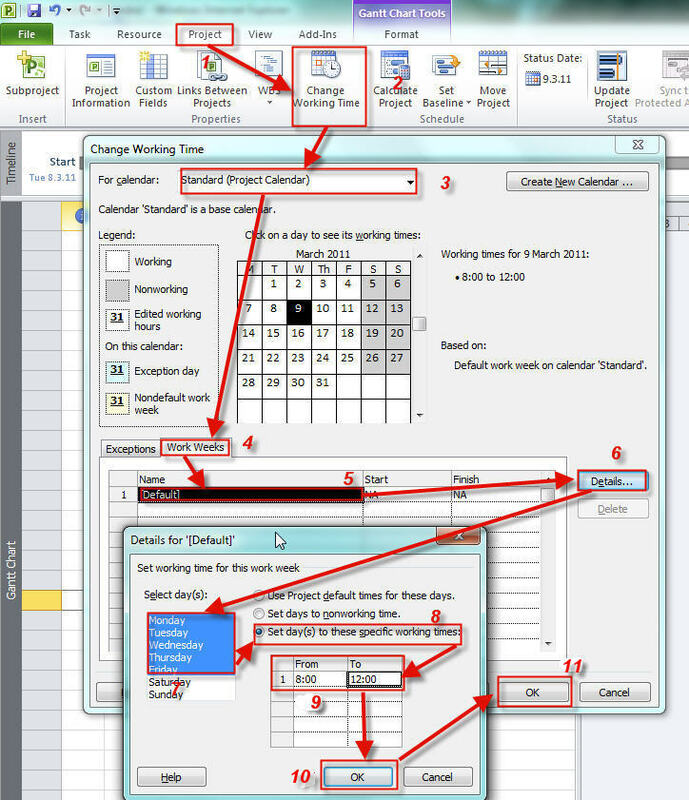 If your start date is different from end date, MS PROJECT will respect working hours from calendar (in our example it is 9 hours / day) for first, second, third etc day EXCEPT last day (end date) which will last 8 hours (hours per day from scheduling options). Task 1 has duration of 0,88 days, and Task 2 duration of 1,75 day. Now, you know the duration formula, don’t you? Duration of one day means 8 hours. We will work 7 hours on Task 1 (because we put that in the calendar; from 08:00 till 15:00). 7 working hours / 8 hours per day in scheduling options = 0,88 days. Task 1 has duration of 1 day, and Task 2 duration of 2,13 day. we put that in the calendar; from 08:00 till 17:00). scheduling options you said that you will have 8 hours per day. So 8 working hours / 8 hours in scheduling options = 1 day. For Task 2 we will work 9 hours on 22.03.11 and 8 hours on 23.03.11 so it means we will spend 17 hours in total. And 17 working hours / 8 hours in scheduling options = 2,13 days. You may ask yourself: “WHAT IS WRONG NOW!??”. Well, nothing is wrong. That is the way MS PROJECT works. If your start date is different from end date, MS PROJECT will respect working hours from calendar (in our example it is 9 hours / day) for first, second, third etc day EXCEPT last day (end date) which will last 8 hours (hours per day from scheduling options). This entry was posted in Microsoft PRoject 2010, MS PROJECT 2010, PMI, PRoject Management. Bookmark the permalink. 4 Responses to Scheduling problems in MS PROJECT 2010 – Part 2. Thank you very much, Now I understand why….. This is the only article which could explain fully and clearly the scheduling problem. živim i radim u Rijeci. Zanima me da li postoji tečaj ili seminar koji bih mogao pohađati kako bih savladao osnove rada i primjene u MS Projectu 2010? Ujedno, Imam problem sa instaliranim MS Projectom 2010 na svojim Windowsima 7. Naime očito postoji nekakav bug koji mi onemogućava otvaranje i pregledavanje .mpp fileova, a osim toga pokrenutu aplikaciju ne mogu zatvoriti normalnim načinom već jedino preko Task Managera. U nadi da ćete pomoći savjetom, srdačan pozdrav. treninzi se održavaju ali neredovito. Mislim da ih drži Algebra! Što se tiče vašeg problema, ne znam što bi Vam rekao. Meni radi sve OK! Pokušajte skinuti verziju s MIS sajta pa onda ukucati Vaš produkcijski ključ! Zaista ne znam o čemu se radi!